Smaller than other approved lights, the HemiLight3 features rounded edges to maintain the integrity of inflatable life jackets. Attachment loops accommodate up to 5 cm (2 in) wide webbing, and the marine tough design ensures years of useful service. The high-intensity flashing LED light automatically activates for 20+ hours when it comes in contact with salt or fresh water, and can be deactivated simply by pushing the red button. Installation is quick and easy (the HemiLight 3 can be retrofitted to almost any style life jacket in a matter of seconds).Size: 2.44 x 1.19 x 1.13" (6.19 x 3.02 x 2.87 cm). Battery: Non-hazardous lithium. 5 year life (non-replaceable). Meets DOT and IATA rules for safe transport. 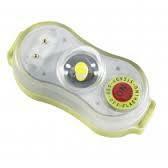 Activation: Automatic when in contact with water (fresh or salt), deactivate via manual off button. Waterproof: Water tight to 10 ft. (3 m). Meets IMO standard.